Summary –Thompson shows his readers that he still hasn’t lost his fastball. This collection is uneven – and not Thompson’s best – but fans will still enjoy it. Review – After Hunter S. Thompson’s dreadful Generation of Swine (1988), I was tempted to write him off as a total has-been. Swine was so bad that I thought that HST might finally have gone “one toke over the line” and lost his muse, forever. Songs of the Doomed, then, is a nice surprise – a modest success that will appeal to HST’s devoted fans. The best stuff in Songs is fantastic. In a section on the 1960s, Thompson gives some history on some of his famous works. In an excellent, short 1976 piece titled “High-Water Mark” (pp. 140-142), Thompson recounts what it was like to participate in the 1960s; he realized – even then – that the experience would not come again. Another favorite is “I Told Her It Was Wrong” (pp. 191-206) – a pure-Gonzo, Rolling Stone article on the Roxanne Pulitzer divorce trial in Palm Beach. There are several other great pieces in Songs. As much as I enjoyed the short articles, Song’s real treats were excerpts from two unpublished novels. The first is Prince Jellyfish, a coming-of-age tale set in 1950s Manhattan. The excerpts of Jellyfish – while only pretty good – are interesting, as Thompson’s first (known) attempt at a novel. Even better is The Silk Road, a novel set in the Florida Keys during the Mariel boat lift (1980). The tale concerns drug and immigrant smuggling, a sexual triangle, and lots of Gonzo behavior. Chances are that both novels remain unfinished, or finished only in draft form. So, Thompson’s fans will pine over “what might have been” after reading the excerpts. Though I am a Songs fan, it has drawbacks – which are also apparent in Thompson’s other late-career writing. The material is uneven and the reader has to wade through the failures to get to the gems. (Am I mixing my metaphors?). Apparently, Thompson was – as usual – short on material and filled in by reprinting old material; unfortunately, Thompson repeated the same material in multiple books. (For instance, “Midnight on the Coast Highway” is here and in at least two other books). Perhaps the most-disappointing aspect of doomed is Thompson’s coverage of his “lifestyle bust” in 1990 when he was hit with eight felony charges after a hot-tub party at his home went very wrong. (Thompson was exonerated). Songs concludes with HST’s coverage of the case, but the section relies – not on HST’s writing – but on notes from attorneys, newspaper stories, etc. I can understand why Thompson spent his time fighting the charges, but the reader wants his take on the case. Songs of the Doomed is a qualified success. Thompson would have his renaissance in the 1990s and 2000s, though, he never matched the groundbreaking Hell’s Angels (1966), Fear and Loathing in Las Vegas (1971), and Fear and Loathing on the Campaign Trail ’72 (1973). 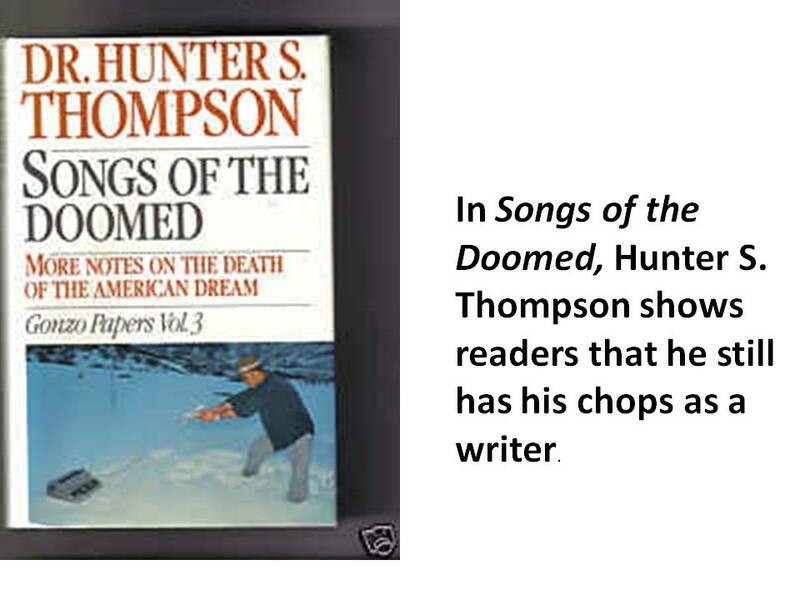 Still, Songs of the Doomed is well worth a look for Thompson’s loyal followers. This entry was posted in Books, Articles, & the Arts, Semi-Informed Reviews & Opinions and tagged book review, drugs, Gonzo Journalism, Hunter S. Thompson, New Journalism, Songs of the Doomed. Bookmark the permalink.